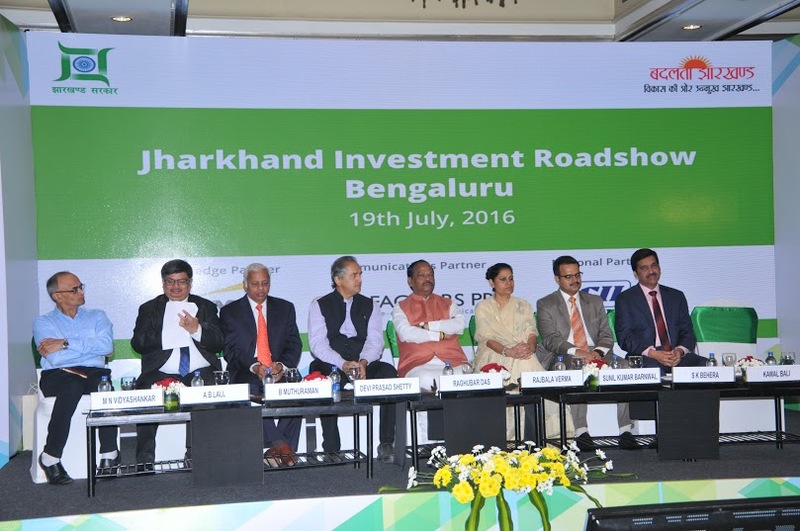 Bengaluru, July 19, 2016: The Government of Jharkhand today formally launched its investment promotion campaign “Momentum Jharkhand” in the city. The state was ranked among the best performing states in business reforms, based on an evaluation by the Department of Industrial Policy & Promotion. “Jharkhand, in a sense, is the backbone of the Make in India mission, since it holds 40 per cent of India’s natural mineral wealth and on track to become the country’s power hub by 2019”, the Chief Minister said in his address. “It is my privilege and responsibility to work in tandem with our Hon’ble Prime Minister on his Government’s vision for Sabka Saath, Sabka Vikaas. My government’s policies are in sync with those of the Government of India, in that we truly work as a team with unity of purpose”, he added. The Chief Minister emphasized that his government was totally committed to protecting and securing the wellbeing of investments, public life and property. Ever since the incumbent government came to power in December 2014, there has been not a single major incidence of industrial conflict. “Through highly responsive governance systems, we have ensured near perfect industrial harmony. The DIPP assessments on Business Reforms prove our unparalleled progress on labour reforms. It is testimony to the culture of the State’s people and their outlook towards organized systems of livelihood”, the Chief Minister said. Chief Secretary Ms. Rajbala Verma added, “We have ensured that the most investment-ready opportunities are adequately presented to prospective investors in the form of a “Shelf of Projects” publication. It represents what we can call the low hanging fruits that early bird applicants can get on board with. The project categories spanned across the spectrum of focus sectors.” Industries Secretary Mr. Sunil Kumar Barnwal made a crisp presentation on the investment opportunities in Jharkhand. On the occasion of this road show, Government of Jharkhand signed an MoU with Cisco to impart networking training to the students of engineering colleges, polytechnics and degree level Institutions in Jharkhand through the Cisco Networking Academy Program to increase the availability of skilled networking resources from within the state. o Power Generation and Distribution. o Manufacturing of Equipment required to set up Power Generation units. The next road show is scheduled to be held tomorrow, July 20 2016 at Hyderabad. In a bid to boost the 'Make in India' initiative taken by the Hon. Prime minister Shri. Narendra Modi and develop high value investment opportunities in the state of Jharkhand, the state Government led by Hon’ble Chief Minister Shri. Raghubar Das has organized the maiden 'Jharkhand Global Investor Summit' on 15–16 February 2017 in Ranchi. The summit aims to establish Jharkhand a premier Investment destination for both foreign as well as domestic investors basis macro-economic system through equitable and sustainable growth, enhance prospects of livelihoods for the people of the state and provide a platform for new ideas and innovations for future investment opportunities.